2 or more: $39.10 ea. Iron Man employs his top technology to battle evildoer and now, so can you. When it’s time to take on the bad guys, slip on this glove to assume the superhero identity. Motion-activated lights on the 3-in-1 repulsor blaster accessory alert you when your enemies come lurking. Awesome sounds will add to your excitement. Once you’ve got your target in sight, launch your 4 repulsion missile accessories. It’s just another win for you, a virtually indestructible hero. 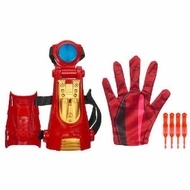 Blaster accessory comes with glove and 4 repulsor missile accessories.